I’m shocked. (Picks up and counts betting pool winnings.) Shocked, I tell you. Politics makes for strange something-something. Well, put your money where your mouth is. wait a second…that half orc who was too compassionate according to gruumsh…..could that be her son? that could be quite possible, since Halvelocks son was probably executed along with his father. Well, the hair matches too, but King Taurox was in the strip where Havelock was killed (by elimination, I was guessing the zombie-looking one). I’m confused and feeling like I’m missing something very obvious. Well now I feel like I’m missing something obvious, what does that have to do with her and Anroth’s son? Wait no the character tags, I get it now. Well, I assume that in panel 3 of strip 1386 the faces match the adjectives they share a line with. This certainly fits with Glon being glandular, and from what we know might fit with Halvelock being compassionate, as per Anroths influence. Further assuming that Gruuumsh listed his attempts at making the perfect warrior in chronological order, this would mean that Glamors son is the stupid one. Now, I certainly don’t want to put stupidity into the same basket with idealistic and/or naive world views, quite the contrary. However, they do occasionally share some common ground. Plus, not everyone is the perfect cross of their parents. All this would also fit with Richs usually very consistent and generally excellent layout-skills. On the other hand, now that I think about it some more… Impatience might also fit Halvelock, so her child could indeed be the one on the top right in said panel, presumably Taurox. The hair fits, and being compassionate wouldn’t come at a surprise either, with those two as the parents. Meh, I don’t know… guess we will know soon. What does bother me, is that apparently human in this verse are somehow appalled by idea of peace with their neighbors. You’d think that both feudal lords and commoners would welcome end of constant border raids and skirmishes. Unlike more violent cultures like Orcs an Bugbears, who welcome conflict, whether of low intensity or outright war, because it provides them opportunity for plunder and such. Sure, humans might not *like* other races, but you’d think they’d welcome "and stay out" type of peace treaty. Now, this hostility to peace treaty would make perfect sense, if Orcs and Bugbears in the past kept signing peace treaties only to break them first chance they had to backstab humans… but then again it wouldn’t make sense for any humans to accept bugbear king on *technicality*. Why wasn’t he hacked to death by all the knight present when he started to cheat?! Yes, all what you said applies to Orcs and Bugbears and such, but there was no indication this applies to humans. They seem ordinary feudal society who fights for ordinary feudal reasons like conquering territory. But even "warrior societies" who love war for sake of war, acknowledge that peace is necessary, if only to gather strength to prepare for war, or secure flank while fighting someone else. I can imagine priests commanding to go to war, but I cannot imagine them prohibiting strategic peace with target of lesser priority to make easier fight with target gods commanded to destroy *right now*. Yes. 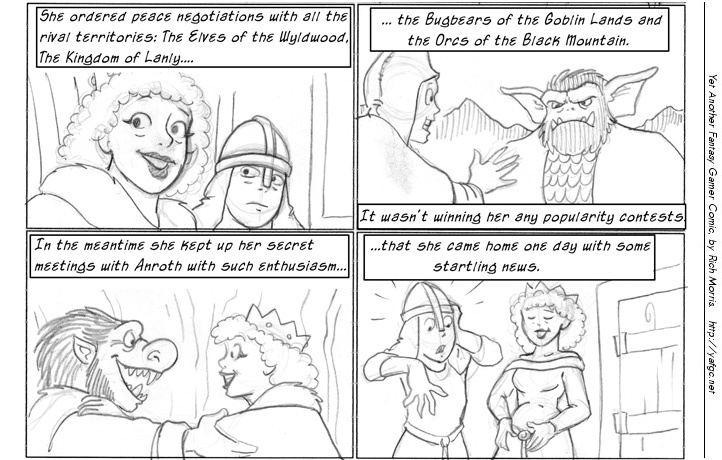 "Lets make peace with orcs so we can crush the bugbears. *Then* we’ll fight the orcs" makes sense. "There can never be peace! We are at war with everyone all the time!" does not. I know what Orcs achieve from war with humans: loot and personal honor. Tell me what humans actually get from war with Orcs that they wouldn’t get if they could someone persuade Orcs to leave them alone for couple of years. Not necessarily. These humans, in this area, at this period. As to why, that’s answered in Strip 3149. Well, princess Glamor was wrong about her unification ideas. Orcs didn’t want peace with humans, even Halvelock wasn’t able/willing to stop the raids. She had vision, but no clue how to achieve it, neither did Anroth. Nah, having a conveniently placed group of people you can hate, blame all hardships on and murder at your whim can be very useful. Except we hardly *ever* see that. Closest thing to oppression we see, was that human townfolk were *rudely* and *passive agressively* helping Jone’s mother after she arrived at her town with nothing but baby to her name. The only other thing we see is that when someone is murdered, humans are quick to accuse members of certain races to doing the deed…. races whose culture takes pride of being evil murderous backstabbers. We hardly ever saw women being oppressed either and apparently that was a wide enough thing for Jone to recruit a massive army and rampage across the land. Humans in the real world are appalled at the idea of peace with their neighbors. This is called a grudge. Lots of people would rather have further wars of revenge than just accepting peace as things are right now; and there is a distressing amount of real world examples I could give. Especially true, of course, when people think they have, or at least could get, the upper hand. "Why make peace with them when you could crush them?" Uhuh. Except RL humans with grudges not only fight wars, they also have list of demands (territories, reparations, satisfaction of slighted honor, etc), fulfillment of which ends reason to keep fighting. Demands might be unreasonable, but they’re *there*. What are demands that humans have against orcs? "Stop raiding us"? If that’s the demand, there is no reason to not want peace if raids stop. Is it more? Do they want to conquer black mountain? We never see human armies attacking orcish territories, with one exception that was rescue of plucky hobbit rogue. We don’t see humans invading, or even counterattacking after orcish raids in flashbacks either. It makes it look as if they want to *be at war*, but aren’t that keen into actually *waging war*. Oh, I get it – you’re TROLLING. Geez, I admire your commitment. Glamor honey, when your guard wanted you to use protection, I’m very certain he meant in *all* ways. There have been all kinds of things that have been used through history, as a condom or femidom etc.from animal skins to slices of lemon to sponges. I’m certain there are similar things in a fantasy setting. Even in what I laughingly refer to as our "real" world, contraceptives have been in use for a long time…Even as far back as Mesopotamia & Ancient Egypt who had some effective methods. She must be pregnant with Anroth’s kid. She must be carrying Anroth’s kid. Now THAT is what I call the results of some *serious* negotiations!